This page Microcontroller versus microprocessor describes similarity and difference between microcontroller and microprocessor. As Mentioned in the figures, Microcontroller and microprocessor both have got CPU, ALU and registers (PC, IR, etc). 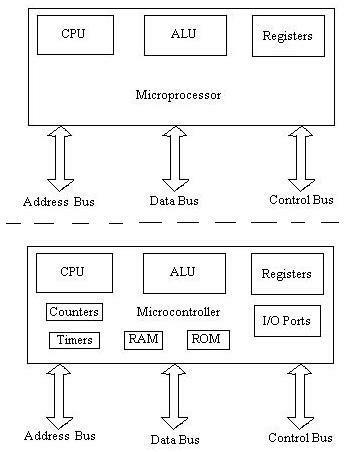 Microcontroller and microprocessor have address bus, data bus and control bus. Address bus carry data which point to specific locations on memory/external devices. Data bus carries data. Control bus carry control signals. Microcontroller usually operates at frequencies in MHz range while today's Microprocessor operates in GHz frequency range. This clock is provided using oscillator. Microcontroller and microprocessor both have their own applications. Hence both cannot be used for each other's functional areas except for few exceptions (very low size code/data application). In addition to microprocessor (CPU) functionality microcontroller will have timers, counters, RAM, ROM and Input/Output ports. This page covers very basic details on microcontroller versus microprocessor, if reader wants to gain in depth knowledge on similarities and differences between microcontroller and microprocessor they need to explore both the fields practically. EXAMPLE: Classic example of microcontroller is Intel 8051 and classic example of microprocessor is 8085. One has to understand architectures of both to know difference between 8051 and 8085. Refer 8051 Architecture➤ and 8085 Architecture➤ and 8051 vs 8085➤. Most of the microprocessors have Op-codes for moving data from the external memory to the CPU; Microcontrollers may have one or two. Microprocessors have one/two types of bit handling instructions while Micro controllers have many. Microprocessor is used for general purpose applications while microcontroller is program specific and designed for particular application in consideration. Microprocessor transfers code and data very fast from external memory devices to the chip. While microcontroller is concerned with fast movement of bits within the chip. Refer following links which compares and mention difference between 8085, 8086, 80286, 80386 and 80486 microprocessor types. It mentions figures which covers pin details of ICs 8086, 80286 and 80386.